Herb Chambers and BMW of Sudbury are pleased to announce, Ã¢â‚¬Å“Herb Chambers Cars and CoffeeÃ¢â‚¬Â Saturday, October 10, 2009 from 7:00 AM to 10:00 AM. This event is for motoring enthusiasts looking for a place to take their ride, share stories and admire each otherÃ¢â‚¬â„¢s pride and joy. Herb Chambers Cars and Coffee is completely free and will be held at the all new Herb Chambers BMW of Sudbury, 128 Boston Post Road (Route 20) in Sudbury, Massachusetts. The dealership is located just six miles from exit 26 off Rte 128/95. All enthusiasts including antique, classic, exotic, hotrods, motorcycles and motorsports are invited to attend and there will be plenty of free parking for your vehicle. Free Tee Shirts for the first 200 attendees! Very few people have seen a McLaren F1 up close outside a magazine. Even those of us who caught Ralph Lauren’s silver example at Boston’s Museum of Fine Arts auto exhibition four years ago couldn’t see the gold leaf under the engine lid, or contemplate what a resting 250-mph speedometer would look like slammed to the max. 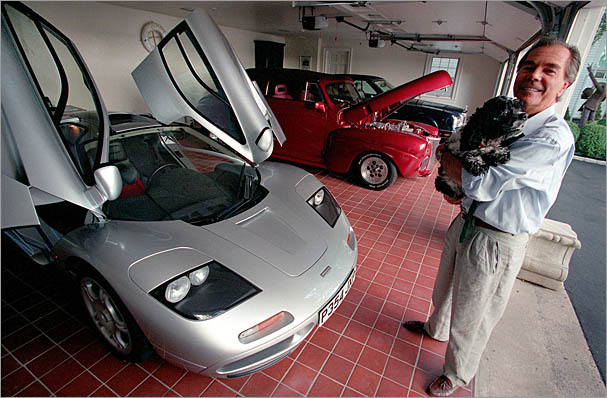 Thanks to mega dealer Herb Chambers, who has a 1995 F1 in his exotic and classic car collection, car enthusiasts can see this supercar very close, and sip some hot brew while they’re at it. As a marketing effort to introduce his 46th dealership in the Massachusetts and Rhode Island area, BMW of Sudbury, Herb Chambers is launching the first of what he hopes will be a monthly gathering of “cars and coffee.” It’s an early morning, no-reservation auto event for cars and motorcycles of any kind (no model discrimination, but preferably not your 1991 Tercel). Join Herb and whomever shows up (there should be enough, given the McLaren alone) from 7 a.m. to 10 a.m. in the Bimmer parking lot on 128 Boston Post Rd. Even though the Bugatti Veyron demolished his F1’s once-record 240 mph top speed, there’s nothing like a little McLaren in the morning. Herb Chambers Companies iPhone App!